The instructions were easy to print and read and it was great to have photos of the castle made out of cardboard and the inspirational photos. After looking at the inspiring photos, I thought about what sort of "look" I wanted. I decided to use all the windows included in the pattern and also add some doors to the towers. I decorated some of the inner details before I stuck the castle together because of the castle design it would have been hard to add detail once the outer wall were added. The pieces fitted together nicely the only ones that didn't were the tower tops - probably because it doesn't say anywhere how thick to roll the dough, this was easily fixed by trimming the gingerbread. Overall it was time consuming because of the amount of pieces and the large size of it, but it was fun! wow that's great!!!!! i might make one of those myself!!!!! 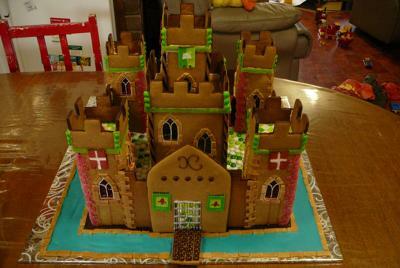 Great job on the medieval castle. It turned out fantastic. Celine, you did an outstanding job! I LOVE the details (flag/banners, entrance gate, window trims and panes, stone floors (it looks like you even make the tower tops have stone floors!),... The moat is great as well! Thanks so much for sharing!